From the moment you enter this holiday property you will be WOWED. Superbly positioned in a diamond location one of the very best New Plymouth has to offer. You will be jumping for joy on this vacation. Stylish and sassy top notch everything WIFI, LIFT, BOSH APPLIANCES and QUALITY SOUND SYSTEM. Split over three levels to elevate you to maximize the stunning coastal views this apartment boasts luxurious living at its best. Internal access garaging. Central heating system to keep you cosy. As soon as you enter you will know you are on holiday, grab a glass of wine, pull back the glass doors, step on to the deck and watch the waves roll in. Fully equipped quality kitchen, three stunning bathrooms and luxurious bedrooms opening on to decks and the garden. On those cold winter days, snuggle down with a good book and watch the waves crashing in. All Bach Break properties come well equipped with cooking oil, salt, pepper, coffee, tea, sugar, milk, cleaning products, dishwasher tablets, dishwashing liquid, toilet paper, liquid hand soap and body wash.
Park your car up you wont need it a short stroll along the coastal walkway connects you to all major New Plymouth attractions. Govett Brewster Art Gallery, Pukeariki, Len Lye Centre, Pukekura Park, Bowl of Brooklands, Shopping, Resturants, Cafes and Beaches. REMEMBER to bring your sunblock, beach towels and your jandals. It doesn't get better than this. Book today and secure your peace of paradise. Bach Break Taranaki has some of the very best holiday accommodation Taranaki has to offer. Check out our feed back. You are guaranteed of a top quality holiday at any of the properties listed with us. 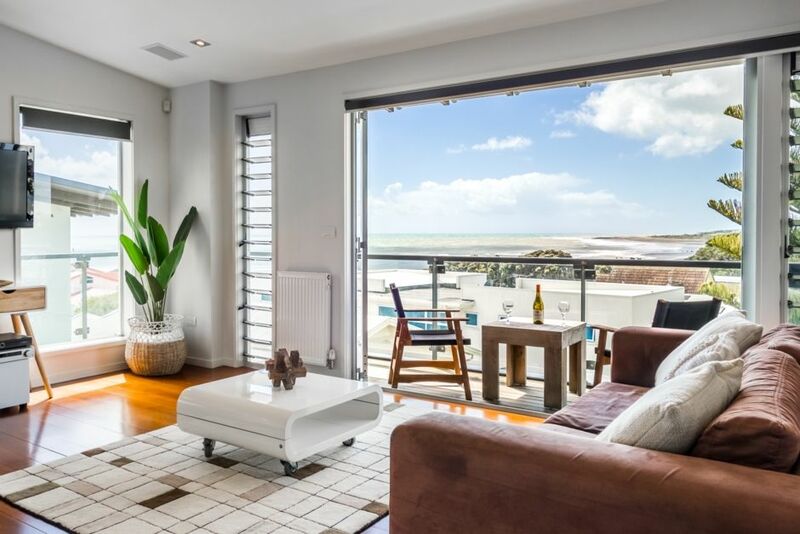 Beautiful on Buller is managed on behalf of it's owners by Bach Break Taranaki, a locally owned holiday management company. Take the risk out of your holiday & avoid sub-par stays: we offer secure payments, 24/7 booking support, property vetting (no more dodgy houses! ), hotel quality linen and cleaning, optional extras like high chairs and port-a-cots. We are with you the whole time from first contact through to departure. The elevator extends over 3 floors, from the ground floor internal garage to the top floor living areas. We offer extra equipment to make your stay easier. You can book a port-a-cot, highchair, stroller, extra heater all for a low one-off fee. You can also purchase a Damage Waiver for $29, which gives you cover for any accidental damage up to $500 inc gst. Email us as bookings@bachbreak.com to request. Very stylish property in a very noisy location. Would have been great to have a BBQ. Bathroom cleanliness was below average. An excellent beach house and after arriving from the snowy UK last Friday a great beginning to our holiday with my family here in New Zealand . Property could do with a little tlc throughout nd a good dust! Rubbish/recycling an issue when departing. This property is cleaned immaculately throughout which includes dusting. There is a yellow recycle bin, blue bottle bin, red rubbish bags supplied and we remove all rubbish after guest departure. Not sure why the issue as you just leave in the garage as mentioned in our manual. Spent 4 nights in this luxurious and well-designed condo. The location is fantastic. We enjoyed the coastal walkway, restaurants, museums and hiking on Mt. Taranaki. Perfect for couples or friends getting together!